Colostrum replacer manufactured from all natural, harvested first-day colostrum. Guaranteed to deliver 100 grams of IgG to prevent failure of passive transfer. Contains E. coli antibody for the prevention of E. coli diarrhea. Perfect for situations where quality colostrum is not rapidly available. Easy to mix, all-milk protein milk replacer. Contains 24% protein with 18% or 20% edible grade fat for optimal digestibility and maximum daily gain depending on season. Medicated with Bovatec® for control of coccidiosis, direct fed microbials and Celmanax® SPC to support enteric calf health. Supplemented with NeoTec4®, a fatty acid that supports pancreatic development as an aid to weaning. All natural protein pellets fortified with vitamins, trace minerals and Rumensin® designed to be mixed with on farm grain to make starter, grower and transition feeds. A vitamin and trace mineral premix designed to be fed at .25 pounds per head per day and mixed into primarily forage based diets for animals weighing 800 pounds up to two months prior to freshening. It can serve as the sole vitamin and mineral source for these animals. 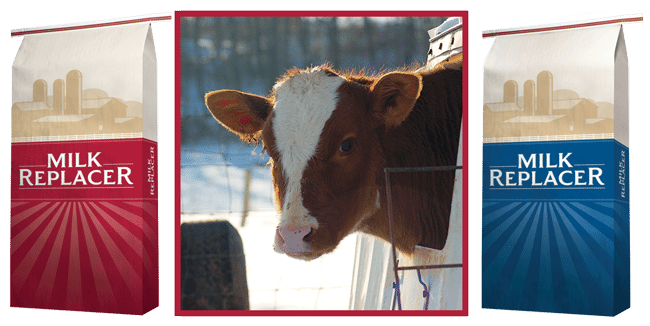 A highly digestible, textured calf starter designed to help wean calves off of milk smoothly and take advantage of early calf growth potential. Contains pelletized vitamin and trace minerals to minimize sorting. Fortified with Neotec4 to help aid weaning, Celmanex to aid in digestion and Rumensin for the prevention of coccidiosis. 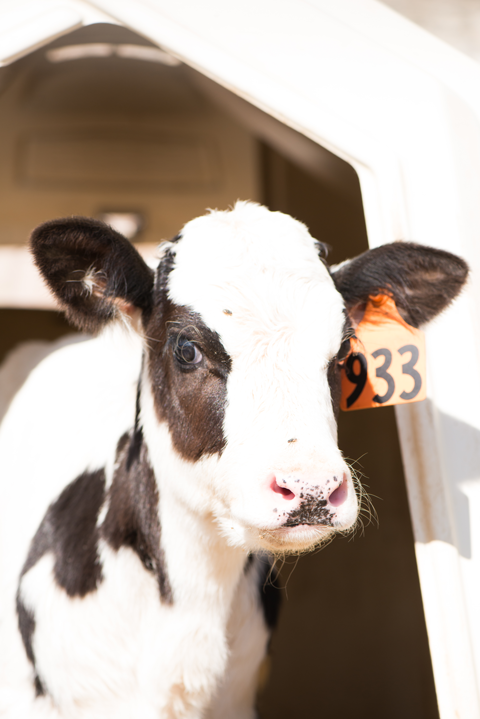 Start feeding at 2 weeks and begin weaning calves from milk replacer when consuming 1.5 pounds of starter. A well balanced pelleted starter designed for increased weight gain, fortified with Neotec4 to help aid weaning, Rumensin for the prevention of coccidiosis, and Celmanex to aid in digestion. Start feeding at 2 weeks and begin weaning claves from milk replacer when consuming 1.5lbs of starter. A balanced, textured calf starter designed with the show calf in mind. Formulated with flaked corn and Rumensin for the prevention of coccidiosis. Contains clarify during summer months. A well balanced textured starter designed for increased weight gain. Contains pelletized vitamins and minerals to minimize sorting. Start fedding at 2 weeks and begin weaning claves from milk replacer when consuming 1.5lbs of starter. Fortified with Neotec4 to help aid with weaning, Rumensin for the prevention of coccidiosis, and Celmanex to aid in digestion. A well balanced pelleted starter designed for increased weight gain, and to prevent sorting. Start feeding at 2 weeks and begin weaning claves from milk replacer when consuming 1.5lbs of starter. Fortified with Neotec4 to help aid with weaning, Rumensin for the prevention of coccidiosis, and Celmanex to aid in digestion. A well balanced texturized feed formulated with quality ingredients using pelletized minerals and protein to prevent sorting in calves that are starting to consume forage. Feed at a rate of 4-6 pounds per day. Fortified with Rumensin for the prevention of coccidiosis. Designed for heifers transitioning onto all forage diets. Feed starting at 4 pounds per head per day in decreasing amounts as heifers age, condition of animal dictates and forage quality allows. Fortified with Rumensin for the prevention of coccidiosis. A well balanced pelleted feed formulated to prevent sorting in calves that are starting to consume forage. Feed at a rate of 4-6 pounds per day. Fortified with Rumensin for the prevention of coccidiosis. A pelleted feed designed for heifers transitioning onto all forage diets. Feed starting at 4lbs per head per day in decreasing amounts as heifers age, condition of animal, and forage quality allows. Fortified with Rumensin for the prevention of coccidiosis. High quality complete and consistent Dairy feed for cattle designed to complement a variety of forages. Formulated with Witmer’s Dairy Pack to optimize the performance and health of your dairy cows. Feeding rate can be varied based on quality of forages and levels of production between 15-30 pounds per day. Designed to prevent peri-parturient diseases such as ketosis, milk fever and retained placentas. Complements corn silage, grass forages and straw diets superbly. Formulated with Rumensin and Witmer’s Dairy Pack. Feed between 4.5 to 6 pounds per head per day to ensure best results. A low inclusion, proprietary vitamin and trace mineral formulation based on the newest independent university research. Complete blend of vitamins, hydrochloride trace minerals and biotin to meet and fulfill the needs of today’s dairy cow on a forage based diet. This pack eliminates the need for costly additional vitamin and chelated mineral supplementation. Feed at .1 pounds per head per day. A low energy, high protein, amino acid balanced, complete feed that promotes lean and rapid frame growth without excessive weight gain. Feed from 4 months and up. CRYSTALYX® BUFFER-LYX® is a unique, nutrient dense, formulation specifically designed for lactating dairy cows that have the potential for experiencing subacute ruminal acidosis (SARA). BUFFER-LYX is formulated with rumen buffering ingredients to maintain maximum levels of feed intake and promote increased milk production while minimizing disorders often associated with high-producing dairy cows. CRYSTALYX Replacement Heifer™ Formula is a high energy, self-fed protein and mineral supplement formulated for the growing heifer. As part of a balanced feeding program, Replacement Heifer Formula will provide needed trace minerals, vitamins, added energy and protein for the developing heifer. CRYSTALYX Dry Cow™ Formula is a self-fed supplement designed for use in addition to a balanced ration for dry Dry Cow Formula is fortified with vitamins, minerals and trace minerals to aid in reducing metabolic disorders and subsequent rebreeding problems. CRYSTALYX Dairylyx™ Formula is a self-fed supplement designed for use in addition to a balanced ration for dry Dry Cow Formula is fortified with vitamins, minerals and trace minerals to aid in reducing metabolic disorders and subsequent rebreeding problems. Always transition animals from one feed to another by gradually mixing the current ration with the one to follow over a five day period. Provide plenty of fresh clean water to your animal at all times. Supplement your animal with a good quality hay or pasture. Never feed moldy or musty feeds to animals. Always follow a deworming schedule suggested by your veterinarian. It is important to deworm your animals at regular intervals to maintain general well-being. Deworming is very important as parasites rob animals of their health and compromise their performance. Witmer’s Feeds are made with high quality and consistent ingredients and are quality assured. Formulations are based on scientific research and designed to complement any on farm nutritional program. Prevents the development of house flies, stable flies, face flies, and horn flies in the manure of treated cattle (lactating and non-lactating beef and dairy cows, slaughter, stocker and feeder cattle, and calves). For the prevention and control of coccidiosis due to Eimeria bovis and Eimeria zuernii in dairy replacement heifers. Plant protein products, grain products, molasses products, animal protein products, processed grain by-products, calcium carbonate, sodium bentonite, DL methionine, natural and artificial flavors preserved with ethoxyquin., natural flavors, artifical flavors, salt, Dl methonine hydroxy analogue, monocalcium phosphate, dicalcium phosphate, urea, kaolin, soybean oil, Vitamin E Supplement, Zinc Hydroxychloride, Manganese Hydroxychloride, Mineral Oil, Copper Hyrodoxychoride, Vitamin A Supplement, Vitamin D Supplement, Cobalt Carbonate, Calcium Iodate, Biotin, Active dry yeast (Saccharomyces Cerevisiae), Yeast Culture (yeast grown dormantized on ground yellow corn, corn gluten meal, condensed fermented corn extractives, cane molasses and malted barley), dried Enterococcus faecium product, dried lactobacillus acidophilus fermentation product, dried Lactobacillus Plantarum fermentation product, dried Bacillus Lentus fermentation extract, dried Aspergillus Oryzae fermentation extract, dried Trichoderma Longibrachiatum fermentation extract, Salt of Glutamic Acid, dried grain products, dried molasses product, roughage products, magnesium oxide, propionic acid, acetic acid, ammonium hydroxide, vermiculite, calcium bentonite, tallow, selenium yeast (Saccharomyces cerevisiae), sodium selenite, vitamin D3 supplement. Feed 2.5 Lbs to 10 Lbs to provide not less than 50 mg nor more than 200 mg of Monensin per head per day and to provide .10 mg/kg of bodyweight of diflubenzuron. Keep out of reach of children. Causes moderate eye irritation. Wear protective eyewear. Avoid contact with eyes or clothing. Wash thoroughly with soap and water after handling before eating, drinking, chewing gum, or using tobacco. Wear long-sleeved shirt and long pants, socks, shoes, and gloves. Do not allow horses or other equines access to formulation containing Monensin. Ingestion of Monensin by horses has been fatal. Monensin medicated cattle feeds are safe for use in cattle only. Consumption by unapproved species may result in toxic reactions. Feeding undiluted or mixing errors resulting in high concentrations of Monensin has been fatal to cattle and could be fatal to goats. Must be thoroughly mixed in feeds before use. Do not exceed the levels of Monensin recommended in the feeding directions as reduced average daily gains may result. If feed refusals containing Monensin are fed to other groups of cattle, the concentration of Monensin in the refusals and amount of refusals fed should be taken into consideration to prevent Monensin overdosing. A withdrawal time has not been established for pre ruminating calves. Do not use in calves to be processed for veal. Liquid Type B feeds shall bear an expiration date of 8 weeks after its date of manufacture. This pesticide is toxic to aquatic invertebrates. Do not contaminate water when disposing of equipment wash waters. Do not contaminate water, food, or feed by storage or disposal. Wastes, including feed bags, resulting from the use of this product may be disposed of on site or at an approved waste disposal facility. (1) Reduced voluntary feed intake in cows fed Monensin. This reduction increases with higher doses of Monensin fed. Rule out Monensin as the cause of reduced feed intake before attributing to other causes such as illness, feed management, or the environment. (2) Reduced milk fat percentage in dairy cows fed Monensin. This reduction increases with higher doses of Monensin fed. (3) Increased incidence and treatment of cystic ovaries and metritis in dairy cows fed Monensin. (4) Reduced conception rates, increased services per animal, and extended days open and corresponding calving intervals in dairy cows fed Monensin. Have a comprehensive and ongoing nutritional, reproductive and herd health program in place when feeding Monensin to dairy cows. Feed continuously to dry and lactating dairy cows in a component feed system (including top dress). Type C feed must be fed in a minimum of 1 lb of feed to provde 185 to 660 mg/head/day Monensin to lactating cows or 115 to 410 mg/head/day Monensin to dry cows. This feed contains added copper, do not feed to sheep or other copper sensitive animals. This feed contains non protein nitrogen. For the first time in the animal health market, here is a product made from True Bovine Colostrum wit 100 grams of bovine origin IgG and dual-claim approval from the USDA-Center for Veterinarian Biologics. This revolutionary product combines the proven, reliable name of COLOSTRUM PLUS with an advanced new formulation resulting in the first-ever products with 100 grams IgG and dual-claim approval to aid in the treatment of failure of passive transfer of immunity and to aid in the prevention of death associated with Escherichia coli K99. This 500 gram feeding is suitable fr a full colostrum replacer for beef and dairy calves. Each package contains one full feeding. Mix one package (500 g) of La Belle Colostrum Plus into 2 quarts (1900 ml) of clean, warm water 100-110 F (38-43 C). Feed to calf by bottle, pail or esophageal feeder. Store at or below 75F (24C). Shelf life recommended conditions is three years. All-milk protein — Contains 24% protein and 18% edible grade fat for optimal digestibility and maximum daily gain. Medicated with Bovatec for control of coccidiosis. Offers direct fed microbials to support enteric calf health. Formulated with ClariFly to stop the development of horn fly, face fly, house fly and stable fly larvae in manure from treated calves. Added NeoTec4, a fatty acid supplement, that supports intestinal health. Formulated with Celmanax SPC to promote gut and intestinal health. Dried whey product, dried whey protein concentrate, animal fat (preserved with BHA, BHT, citric acid & ethoxyquin), dried whey, vegetable fat (preserved with BHT), L-lysine, calcium carbonate, DL-methionine, dried skimmed milk, yeast culture, yeast extract, hydrolyzed yeast, hydrogenated coconut oil, FD&C Blue #1, L-threonine, sodium silico aluminate, ferrous sulfate, vitamin E supplement, magnesium sulfate, choline chloride, natural and artifical flavor, dried Bacillus licheniformis fermentation product, dried Bacillus subtilis fermentation product, maltodextrin, lecithin, ethoxylated mono-diglycerides, propylene glycol, zinc sulfate, vitamin A supplement, selenium yeast, brewer’s dried yeast, dicalcium phosphate, manganese sulfate, copper sulfate, ascorbic acid, vitamin D3 supplement, niacin supplement, calcium pantothenate, menadione sodium bisulfite complex (source of vitamin K activity), biotin, riboflavin supplement, thiamine mononitrate, pyridoxine hydrochloride, vitamin B12 supplement, calcium iodate, folic acid, cobalt sulfate. All-milk protein—Contains 24% protein and 20% edible grade fat for optimal digestibility and maximum daily gain. Dried whey product, dried whey protein concentrate, animal fat (preserved with BHA, BHT, citric acid & ethoxyquin), dried whey, dried skimmed milk, vegetable fat (preserved with BHT), L-lysine, DL-methionine, calcium carbonate, L-threonine, yeast culture, yeast extract, hydrolyzed yeast, hydrogenated coconut oil, FD&C Blue #1, sodium silico aluminate, ferrous sulfate, vitamin E supplement, magnesium sulfate, choline chloride, natural and artificial flavor, dried Bacillus licheniformis fermentation product, dried Bacillus subtilis fermentation product, maltodextrin, lecithin, ethoxylated mono-diglycerides, propylene glycol, zinc sulfate, vitamin A supplement, selenium yeast, brewer’s dried yeast, dicalcium phosphate, manganese sulfate, copper sulfate, ascorbic acid, vitamin D3 supplement, niacin supplement, calcium pantothenate, menadione sodium bisulfite complex (source of vitamin K activity), biotin, riboflavin supplement, thiamine mononitrate, pyridoxine hydrochloride, vitamin B12 supplement, calcium iodate, folic acid, cobalt sulfate. A medicated supplement formulated for growing cattle on pasture or in dry lot (stocker and feeder; dairy and beef replacement heifers) for increased rate of weight gain. Plant Protein Products, Processed Grain By-Products, Molasses Products, Calcium Carbonate, Sodium Sesquicarbonate, MicroEncapsulated Dry Active Saccharomyces Cerevisiae, Dicalcium Phosphate, Monocalcium Phosphate, Salt, Magnesium Oxide, Zinc Sulfate, Ferrous Sulfate, Manganese Sulfate, Copper Sulfate, Ethylenediamine Dihydriodide, Cobalt Sulfate, Potassium Sulfate, Magnesium Sulfate, Niacin, Vitamin B-12 Supplement, Riboflavin, d-Calcium Pantothenate, Choline Chloride, Vitamin A Supplement, Vitamin E Supplement, Vitamin D-3 Supplement, Menadione Dimethylpyrimidinol Bisulfite (Source of Vitamin K Activity), d-Biotin, Folic Acid, Thiamine Mononitrate, Pyridoxine Hydrochloride, and Sodium Selenite. Feeding each mix at their corresponding feeding rates will supply 50-200 mg of Monensin per head per day. During the first 5 days of feeding, cattle should receive no more than 100 mg of Monensin per head per day in not less than 1 pound of feed. For calf mixes: whole or rolled grains verses ground grain is preferred by the calf. For grower mixes: forage quality and amount should be used to determine protein level, mineral and vitamin supplementation, and amount to be mixed into the feed. For further mixing and feeding directions please contact your Witmer’s Feed sales representative for additional information. Do not allow horses or other equines access to feed containing Monensin. Ingestion of Monensin by equines has been fatal. Monensin-medicated cattle and goat feeds are safe for use in cattle and goats only. Consumption by unapproved species may result in toxic reactions. Do not feed undiluted. Feeding undiluted ormixing errors resulting in high concentrations of Monensin has been fatal to cattle and could be fatal to goats. Do not exceed the levels of Monensin recommended in the feeding directions, as reduced average daily gains may result. If feed refusals containing Monensin are fed to other groups of cattle, the concentration of Monensin in the refusals and amount of refusals fed should be taken into consideration to prevent Monensin overdosing. Increased rate of weight gain; For prevention and control of coccidiosis caused by Eimeria bovis and Eimeria zuernii. monocalcium phosphate, dicalcium phosphate, calcium carbonate, salt, Processed Grain By-Products, Vitamin E Supplement, Zinc Hydroxychloride, Manganese Hydroxychloride, Mineral Oil, Copper Hyrodoxychoride, Vitamin A Supplement, Vitamin D Supplement, Cobalt Carbonate, Calcium Iodate, Biotin, magnesium oxide, tallow, selenium yeast (Saccharomyces cerevisiae), roughage products, sodium selenite. Feed .06 lbs to .25 lbs to provide not less than 50 mg nor more than 200 mg of Monensin per head per day. Do not allow horses or other equines access to formulation containing Monensin. Ingestion of Monensin by equines has been fatal. Monensin medicated cattle feed is safe for use in cattle and goats only. Feeding undiluted or mixing errors resulting in high concentrations of monensin has been fatal to cattle and could be fatal to goats. Must be thoroughly mixed in feeds before use. Do not feed undiluted. Do not exceed the levels of monensin recommended in the feeding directions as reduced average daily gains may result. If feed refusals containing monensin are fed to other groups of cattle, the concentration of monensin in the refusals and amount of refusals fed should be taken into consideration to prevent monensin overdosing. A withdrawal time has not been established for pre-ruminating calves. Do not use in calves to be processed for veal. This feed contains added copper, do not feed to sheep or other copper sensitive animals. Prevents the development of house flies, stable flies, face flies and horn flies in the manure of treated cattle (lactating and non-lactating beef and dairy cows, slaughter, stocker and feeder cattle, and calves, including veal calves). For increased rate of weight gain. For the prevention and control of coccidiosis caused by Eimeria bovis and Eimeria zuernii. Plant protein products, processed grain by-products, calcium carbonate, molasses products, blended poultry and vegetable fat preserved with BHA, sodium bentonite, grain products, monocalcium phosphate, potassium chloride, magnesium sulfate, vitamin E supplement, d-biotin, ferrous sulfate, sodium chloride, manganese chloride, zinc chloride, copper chloride, vitamin A supplement, animal fat, selenium, ethylenediamine dihydriodide, cobalt carbonate, soybean oil, Vegetable and Animal Fat (preserved with BHT), Calcium Salts of Long Chain Fatty Acids, Hydrated Sodium Silico Aluminate, Natural and Artificial Flavors, yeast culture, yeast extract, hydrolyzed yeast, FD&C blue #1, propionic acid, acetic acid, ammonium hydroxide, vermiculite, calcium bentonite, roughage products. Feed 2Lbs to 8Lbs to provide not less than 50 mg nor more than 200 mg of Monensin per head per day and to provide .10 mg/kg of bodyweight of diflubenzuron. Do not allow horses or other equines access to formulation containing Monensin. Ingestion of Monensin by equines has been fatal. Monensin medicated cattle feed is safe for use in cattle only. Consumption by unapproved species may result in toxic reactions. Must be thoroughly mixed in feeds before use. Do not feed undiluted. Do not exceed the levels of Monensin recommended in the feeding directions, as reduced average daily gains may result. Keep out of reach of children. Causes moderate eye irritation. Wear protective eyewear. Avoid contact with eyes or clothing. Wash thoroughly with soap and water after andling before eating, drinking, chewing gum, or using tobacco. Wear long-sleeved shirt and long pants, socks, shoes, and gloves. A complete starter feed formulated for growing calves for increased rate of weight gain. Grain Products, Plant Protein Products, Processed Grain By-Products, Cane Molasses, Calcium Carbonate, Vegetable Fat, Lignin Sulfonate, Monocalcium Phosphate, Potassium Chloride, Magnesium Oxide, Potassium Sulfate, Magnesium Sulfate, Salt, Micro-Encapsulated Dry Active Saccharomyces Cerevisiae, Mannan oligosaccharide, Vitamin A Supplement, Vitamin E Supplement, Vitamin D Supplement, Zinc Sulfate, Iron Sulfate, Manganese Sulfate, Copper Sulfate, Ethylenediamine Dihydriodide, Cobalt Sulfate, Sodium Selenite, Propionic Acid, Silicon Dioxide, Garlic, Trans-anethole, Garlic Oil, Thyme, Propylene Glycol, Thaumatin, Cinnamaldehyde, Rosemary Oil, and Selenium Yeast. Feed Elite Calf Starter continuously to provide no less than 50 mg nor more than 200 mg monensin per head per day. One pound of Elite Calf Starter contains 25 mg of monensin. Offering small amounts of fresh feed often will increase intake. Provide free-choice, high-quality hay and fresh clean water at all times. For additional information, contact your Witmer’s Feed representative. Do not allow horses or other equines access to formulations containing Monensin. Ingestion of Monensin by equines has been fatal. Monensin-medicated cattle feed is safe for use in cattle only. Do not feed to lactating dairy cows. Consumption by unapproved species may result in toxic reactions. Do not exceed the levels of Monensin recommended in the feeding directions, as reduced average daily gains may result. Grain products, plant protein products, processed grain by-products, calcium carbonate, molasses products, blended poultry and vegetable fat preserved with BHA, sodium bentonite, monocalcium phosphate, potassium chloride, magnesium sulfate, vitamin E supplement, d-biotin, ferrous sulfate, sodium chloride, manganese chloride, zinc chloride, copper chloride, vitamin A supplement, animal fat, selenium, ethylenediamine dihydriodide, cobalt carbonate, soybean oil, propionic acid, acetic acid, ammonium hydroxide, vermiculite, calcium bentonite, roughage products. Feed 2 Lbs to 8 Lbs to provide not less than 50 mg nor more than 200 mg of Monensin per head per day and to provide .10 mg/kg of bodyweight of diflubenzuron. Grain products, plant protein products, processed grain by-products, calcium carbonate, molasses products, blended poultry and vegetable fat preserved with BHA, sodium bentonite, monocalcium phosphate, potassium chloride, magnesium sulfate, vitamin E supplement, d-biotin, ferrous sulfate, sodium chloride, manganese chloride, zinc chloride, copper chloride, vitamin A supplement, animal fat, selenium, ethylenediamine dihydriodide, cobalt carbonate, soybean oil, yeast culture, yeast extract, hydrolyzed yeast, FD&C blue #1, roughage products, propionic acid, acetic acid, ammonium hydroxide, vermiculite, calcium bentonite. Grain products,plant protein products, processed grain by-products, calcium carbonate, molasses products, blended poultry and vegetable fat preserved with BHA, sodium bentonite, monocalcium phosphate, potassium chloride, magnesium sulfate, vitamin E supplement, d-biotin, ferrous sulfate, sodium chloride, manganese chloride, zinc chloride, copper chloride, vitamin A supplement, animal fat, selenium, ethylenediamine dihydriodide, cobalt carbonate, roughage products, propionic acid, acetic acid, ammonium hydroxide, vermiculite, calcium bentonite. Grain products, plant protein products, roughage products, processed grain by-products, molasses products, calcium carbonate, Vitamin E Supplement, Zinc Hydroxychloride, Manganese Hydroxychloride, Mineral Oil, Copper Hyrodoxychoride, Vitamin A Supplement, Vitamin D Supplement, Cobalt Carbonate, Calcium Iodate, Biotin, propionic acid, acetic acid, ammonium hydroxide, vermiculite, sodium bentonite, calcium bentonite, sodium selenite. Feed 20-25 pounds per cow per day or contact your local feed consultant for more detailed instructions. For increased milk production efficiency (production of marketable solid-corrected milk per unit of feed intake) in dairy cows. Plant protein products, roughage products, animal protein products, magnesium oxide, magnesium sulfate, Processed Grain By-Products, Calcium Carbonate, Vitamin E Supplement, Zinc Hydroxychloride, Manganese Hydroxychloride, Mineral Oil, Copper Hyrodoxychoride, Vitamin A Supplement, Vitamin D Supplement, Cobalt Carbonate, Calcium Iodate, Biotin, salt, Dl methonine hydroxy analogue, sodium selenite. Feed continuously to dry and lactating dairy cows feed containing 11-400 g/ton Monensin. Feed must be fed to provide 185 – 660 mg/head/day (2.28 to 8.15 lbs) to lactating cows or 115 – 410 mg/head/day (1.42 to 5.06 lbs) to dry cows. A withdrawal time has not been established for pre-ruminating calves. Do not use in calves to be processed for veal. Do not allow horses or other equines access to formulation containing Monensin. Ingestion of Monensin by horses has been fatal. Monensin medicated cattle feeds are safe for use in cattle only. Consumption by unapproved species may result in toxic reactions. Feeding undiluted or mixing errors resulting in high concentrations of Monensin has been fatal to cattle and could be fatal to goats. Must be thoroughly mixed in feeds before use. Do not exceed the levels of Monensin recommended in the feeding directions as reduced average daily gains may result. If feed refusals containing Monensin are fed to other groups of cattle, the concentration of Monensin in the refusals and amount of refusals fed should be taken into consideration to prevent Monensin overdosing. A withdrawal time has not been established for pre ruminating calves. Do not use in calves to be processed for veal. Liquid Type B feeds shall bear an expiration date of 8 weeks after its date of manufacture. Feed continuously to dry and lactating dairy cows in a component feed system (including top dress). Type C feed must be fed in a minimum of 1 lb of feed to provide 185 to 660 mg/head/day Monensin to lactating cows or 115 to 410 mg/head/day Monensin to dry cows. Prevents the development of house flies, stable flies, face flies, and horn flies in the manure of treated cattle (lactating and non-lactating beef and dairy cows, slaughter, stocker and feeder cattle, and calves). For increased milk production efficiency (production of marketable solid-corrected milk per unit of feed intake) in dairy cows. Grain products, plant protein products, processed grain by-products, calcium carbonate, refined bleached deodorized (RBD) palm stearin, BHT as a preservative, sodium bicarbonate, molasses products, animal fat, vegetable fat, magnesium oxide, salt, saccharomyces cerevisiae, niacin, vitamin B supplement, riboflavin supplement, d-calcium pantothenate, choline chloride, biotin, thiamine mononitrate, pyridoxine hydrochloride, vitamin K supplement, folic acid, calcium aluminosilicate, sodium aluminosilicate, diatomaceous earth, mineral oil, wheat middlings, cereal food fines, dextrose, potassium chloride, lactose, dehydrated alfalfa meal, sucrose, potassium carbonate, citric acid, vegetable oil, calcium salts of long chain fatty acids, tricalcum phosphate, sodium bisulfate, cane molasses, sodium silico aluminate, betaine hydrochloride, active dried yeast, urea formaldehyde condensation polymer, dl-Alpha tocopheryl acetate (source of vitamin E activity), artificial flavors, zinc proteinate, magnesium sulfate, fructose, glycine, dried aspergillus oryzae fermentation extract, wheat bran, calcium lactate, dl-methionine, L-lysine monohydrochloride, vitamin A acetate, saccharin sodium, monosodium phosphate, vitamin D3 supplement, chloine chloride, dried bacillus subtilis fermentation product, dried bacillus licheniformis fermentation product chloine bitartrate, niacinamide, ascorbic acid, calcium pantothenate, riboflavin, vitamin B12 supplement, Dl methonine hydroxy analogue, animal protein products, sodium bentonite, natural flavors, artifical flavors, roughage products, sodium carboxymethyl-cellulose, corn distillers dried grains with solubles, Vitamin E Supplement, Zinc chloride, Manganese chloride, Copper choride, Vitamin A Supplement, Vitamin D Supplement, d-Biotin, Cobalt Carbonate, ethylenediamine dihydriodide, calcium silicate, artificail flavor ingredients, propylene glycol, selenium yeast (Saccharomyces cerevisiae). Feed continuously to dry and lactating dairy cows feed containing 11-400 g/ton Monensin. Feed must be fed provide 185 – 660 mg/head/day (19.47 to 69.47 Lbs) to lactating cows or 115 – 410 mg/head/day (12.11 to 43.16 Lbs) to dry cows and to provide 0.10 mg/kg of bodyweight of Diflubenzuron. 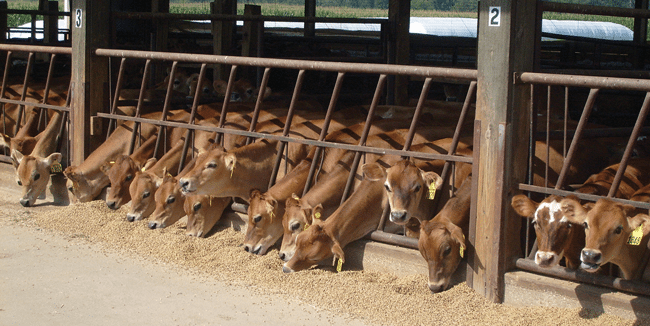 Feed continuously to dry and lactating dairy cows in a total mixed ration.